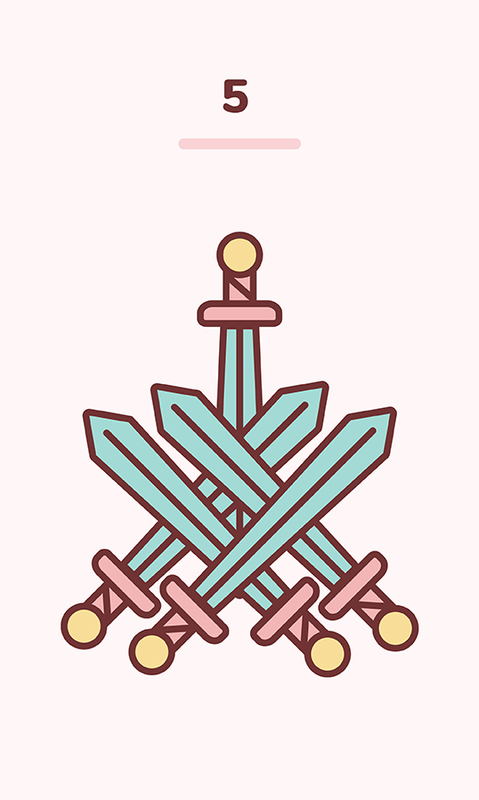 The Five of Swords is a card of battle, defeat, and pride. The suit of swords represents great change, at great costs, while the number 5 in numerology represents new (if foolish) beginnings. If you think of 4 as the stability of a baby on all fours, it is easy to see how 5, as a child standing on their legs for the first time, is a bit wobbly. This card may signify that you must not fight with the prideful person again (you will lose) or that you need to watch your own pride. It could blind you to your own weaknesses and lure you into situations you are not ready for. The Five of Swords represents aggressive conquest, stopping at nothing to accomplish your goals. Unfortunately, sometimes you can end up on the losing side even when you win because of how you make others feel. If you’re not careful, fighting too hard may isolate you and cause you to feel alone. You must look at a battle overall. If you clash with others, you will lose friends. Perhaps it’s time to learn to compromise. When the Five of Swords is upright, it signifies that there has been an overload of pride. When the same card is reversed, it can mean balance in pride. The Five of Swords reversed can stand for a need to honorably act in one’s own self-interest, even if it seems ruthless. It can also represent a feeling of forgiving and forgetting that should be explored. Although the energy is there, it is weak and “receding” due to the nature of reversed cards. Start reading tarot today with free guides, walkthroughs, and tips for tarot newbies. Kawaii Tarot Community will open up soon to email newsletter subscribers.